People analytics is rapidly evolving, delegates at the April 2018 Tucana People Analytics World conference in London heard. As people analytics technology and processes mature and become embedded in organisations, the fundamental nature of people analytics work itself is changing and its potential value to the organisation is increasing. 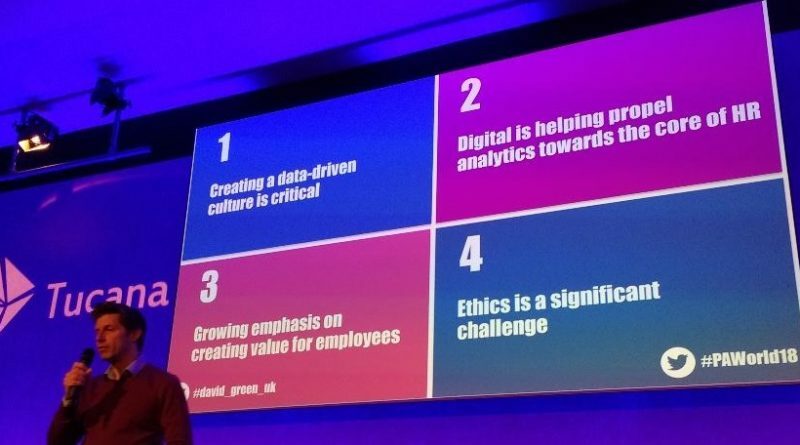 “The focus of people analytics teams is moving away from just analytics to developing products for employers and employees.” This is according to David Green, who chaired the Tucana conference. “The big opportunity for people analytics in 2018 is to improve employee experience and help make the workplace more humane”, he says. The conference line-up included HR professionals from across the globe, who explained how they are using people analytics to improve employee experience, engagement and retention – and thereby boost business performance. Build allies across the business. “Data is not native to HR. It is not what HR teams get excited about”, says author Bernard Marr. Peter Cheese, CEO of the CIPD, agrees: “The problem with HR is that they bring too much PowerPoint and not enough Excel. We need a mixture of both.” HR should therefore be willing to build strategic alliances with other departments within the organisation that have the required skills and specialisms. It is also important that HR recognise that ownership of people management processes is not always the sole responsibility of HR. “Creating a positive work experience doesn’t purely sit with HR”, says Minton. She argues that other departments such as communications, marketing, finance and facilities can all play an important role. Communicate people analytics insights and recommendations clearly and precisely. Storytelling skills are critical to the success or failure of people analytics initiatives, argues Clement. HR has to be able to communicate the findings of people analytics activities in a compelling manner that will inspire business leaders to buy in. When putting together a people analytics narrative, she recommends that HR always ask a simple question: “What’s the hook? How can you articulate it for people who might have no data background?” Return on investment (ROI) is a particularly compelling “hook” for communicating the benefits that people analytics can bring, says Swati Chawla, global head of HR analytics, strategy and planning at Syngenta. “To measure the impact of what we are doing, we should always be looking at the ROI of solutions”, she says. Chawla described how she used people analytics data to boost performance at lower-performing sites across Syngenta’s Asia-Pacific operations. She used people analytics data to cross-reference local team structures against productivity and sales metrics. She described how one local manager in Indonesia at first rejected the concept of people analytics data outright. Chawla persisted, taking a different tack by explaining to him that her data showed how a simple reorganisation of responsibilities within his team would free up 544 hours of sales time per month. The manager immediately recognised the efficiencies this would bring, and became an enthusiastic supporter of people analytics. XpertHR is launching Retention Analytics, a powerful new people analytics product, focused on employee retention. Powered by deep analytical expertise and Big Data technology, our interactive, cloud-based tool will help you reduce unwanted turnover, optimise people management and drive business success. With years of experience in analysing HR data and empowering HR professionals, we provide the expertise so there is no need for a data scientist or any analytical experience to start your people analytics journey. Contact us to learn more about how XpertHR can help you take the next step on your journey to evidence-based decision-making.